Hey, guess what? This is a real good film. Actually, the first half of this production is an excellent movie and the second half is still pretty darned-good. As the title implies "Batman Begins" is an origin story. This is usually my favorite part of Superhero epics -- how about you? The filmmakers took some interesting risks in casting a lesser-known, though strong actor -- Christian Bale. Bale fits the role and the costume well. He's brooding, strong, vulnerable, yet decisive -- and perhaps even more than all of that -- as about as real/believable as Batman gets. Another surprise is director Christopher Nolan of the highly acclaimed Memento. For those who haven't seen this unique, yet brain-straining feature; suffice to say that Nolan is great with thought and suspense -- but action? What an exciting risk to employ. Personally, I think these risks pay off in spades. 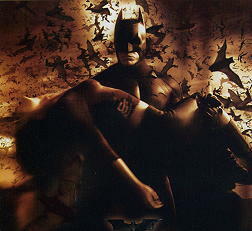 This is a film that cares a great deal for what is going on inside the Bat-Man's head; the action is more of an accent. The fight scenes are shot close in; Nolan seems to have made a conscious decision not to compete with other more "martial arts" hand-to-hand action flicks. His action scenes are dark, the sounds and movement jeer a chill or more accurately -- fear. Building a solid motif around fear, this strong screenplay unfolds masterfully until the two-thirds mark, at which point some of the pacing slips just a bit, and further complications blur its initial beauty. I enjoyed the idea of the masked foe introduced at that point, but his actual execution on film smacked of the phony supervillians I didn't like in earlier Batmans. That said, the film's other foes are well-acted, enjoyable, respectably intimidating. A good film -- you'll get your money's worth. "It's fascinating to me," Says writer/director Nolan, "the idea of a person who would confront his innermost fear and then attempt to become it." Batman Begins. Copyright © 2005. Starring Christian Bale, Liam Neeson, Michael Caine, Katie Holmes, Gary Oldman, Cillian Murphy, Tom Wilkinson, Morgan Freeman. Screenplay by Christopher Nolan and David S. Goyer. Produced by Emma Thomas and Charles Roven, Larry Franco, at DC/WB.